Meet Meeko. He is bonded with Rocky. 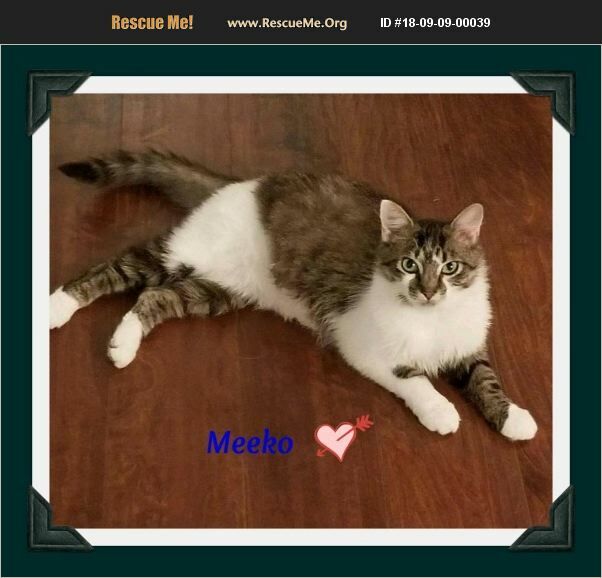 Meeko has very thick, plush British Short-hair silky fur. He is about 11 to 13 months old. Very personable. These two boys are lap fulls of loving and playfulness. Rocky and he love to race around the house with cat crazies or play jumping and swatting at each other playfully on their cat tower. These two will provide many happy moments and laughs, they are just goof balls together. Meeko is fully vetted, neutered, up to date on vaccinations, tested for FIV and FeLV - negative, and microchipped. Come see our handsome boys, they will not disappoint you. We offer a two week trial adoption to ensure our kitties are a good fit for your home, We don't want you to keep them if you don't absolutely adore them! We have dozens of kitties available, just search this site for Snow Camp Sanctuary. Thank you for viewing our rescue kitties!